Strollers – even the cheap ones – are among a few other things that you don’t replace every season. This could be not only because of cost considerations but also because some strollers are just hard to get a perfect replacement for. That being said, proper and regular cleaning and maintenance is a must. Although good appearance is the most obvious benefit of a frequently cleaning, these benefits extend beyond mere appearance. Proper cleaning and maintenance regimen can significantly minimize tear and wear thereby prolonging the life of the stroller and saving you lots of money in the long run. Most importantly, a well-maintained baby stroller runs smoothly thereby giving you and your passenger an easy and enjoyable time during your strolls. Although the wheels tend to take the most punishment especially if you live in areas with lots of sand and rough winters, virtually all parts of the stroller require some form of cleaning and maintenance every now and then; fabrics, tires, seat, and the frames. So, how do you go about cleaning and maintaining your stroller? Yeah, I know it may sound silly, but it turns out parents usually skip reading stroller’s manual. 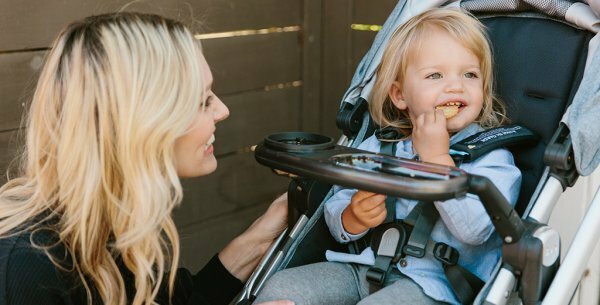 The importance of this, however, is to understand how to remove different parts of the stroller such as the wheels, canopy, and fabrics without tearing or causing breakages. If you can’t get your manual, try searching for it on the manufacturer’s website. Most strollers have a detachable fabric and seat although there are others that are permanently fixed. The former is easy to give a deep clean since it’s a lot easier to get into nooks and crevices that might otherwise be hard to access in an undetachable model. Use a soft towel soaked in soapy water to wipe down the fabric elements and the seating area. Keep in mind that kids’ skin is highly sensitive. It’s, therefore, important to consider detergents that are meant for their sensitive skin. The frame is what holds every other part of the stroller together. While it’s not easy to realize it, it tends to accumulate a lot of dirt and grime with time thereby necessitating some cleaning. The frame can also be very costly to replace. Thus, you should take this as the right time to inspect it thoroughly for parts that might require urgent correction to prevent expensive repairs or replacements in the future, or what’s worse – breaking down when the baby is in the stroller! Importantly, this is a good time to inspect the brakes to ensure that they are locking both wheels securely. In case they are loose and/or squeaky, this is the time to tighten and lubricate them. Check the frame’s joints and nooks for trapped dirt and debris such as twigs and leaves. Crumb and vacuum the dirt if necessary. At the same time you should inspect the frame for any damages, breakages or loosening. Similar to the seat and fabrics, the frame plus the accessories should not be subjected to intense heat or direct sunlight. Remember to leave the stroller in well-ventilated room or outside the house, but in the shade to dry completely. It will prevent the fabric from getting moldy and the frame from rusting. Pay attention to where you store your stroller – if you want to keep it in a good shape and prevent from getting moldy and smelly keep it in a well-ventilated and fry place (like closet), not a damp garage. Whether you have been traversing the urban jungle or stomping the trails, your stroller’s wheels will have collected a good deal of dust and dirt by the end of the stroll. It will always be a good idea, therefore, to give them a thorough brush down every now and then to ensure that they are in top-notch condition. In addition, while the entire stroller may not require cleaning every day, you don’t want to get a muddy pushchair into the house. A powerful blast with a hose followed by a simple wipe with a clean dry cloth is all you need to dislodge mud and leaves from the wheels before pushing the stroller into the house after each walk. However, it’s advisable to remove the wheels completely every now and then for a deep clean. Most wheels feature a release mechanism that allows you to take them off. This should also be indicated somewhere in the manual. Once the wheels are out, use warm, soapy water and a piece of cloth to clean the tires. A stiff brush may come in handy in dislodging mud that has dried on the tires. If the wheels use bearings, this might be a good time to lubricate them. Although oil and silicone lubricant work just fine, they tend to attract a lot of dust and dirt that build around thereby making the next maintenance messier. That’s where you’ll find a non-stick Teflon type lubricant really handy. Once you are through with the wheels, don’t forget to clean and lubricate the moving parts where you removed the wheels. These areas also need to be cleaned (usually with a paper towel) to remove small stones and other debris. Later, apply a generous spritz of Teflon lubricant before putting back the wheels. It is very important to clean the wheels right after a stroll, especially if you went to the beach, because the combination of salt and sand may damage the wheels (especially the air-filled tires and bare bearings). It may be also corrosive to the stroller frame. More tips on how to clean the stroller you can find in this video. If you need help with choosing the right stroller for your baby, visit LittleBabyGear.com and check my detailed reviews.